Will the pontiff be able to sway the notoriously conservative Philippine Catholic Church? When Pope Francis makes his first trip to the very Catholic Philippines later this month, long-term observers will be hoping the head of the Holy See will move away from the harsh, more traditional doctrine of the past, with a liberal dose of realism in his sermons. References to the state of the world following the latest attack by Islamic militants, this time in Paris, will feature prominently in the pontiff’s sermons alongside environmental degradation and political oppression. This pope is pro-science and has been refreshing in his easier stance on Church dogma on issues that challenge its teachings and authority like homosexuality and birth control. Francis has urged Church leaders to moderate their often strong, critical language on gay unions, divorced couples, couples who marry for a second time without seeking a Church annulment and heterosexual couples who live together without being married. But even the Pope has to deal with disunity in his own ranks on that score. In the Philippines, Church obstinance on those issues has constantly dogged this poor and overwhelmingly Catholic country and progress in areas such as women’s rights on abortion, family planning, and birth control. A lack of proper family planning has been blamed as a big factor in ensuring the poverty cycles continue in the Philippines, which has some of the highest rates of unwanted pregnancies in Asia, particularly among the poor. The Catholic Church in the Philippines wields enormous influence and for 16 years it blocked the Reproductive Health Bill. This includes campaigns that spread outright nonsense, like condoms that eat sperm and cause disabilities among new born babies. However, the courts last year recognized the bill as constitutional, clearing a path for the distribution of condoms and birth control among those who need it most but can ill afford the costs. On Wednesday an appeal court upheld a verdict against Carlos Celdran whose protests over Church opposition to government funding of contraceptives and family planning is the stuff of legends. Celdran faces two years in prison under article 133 of the Philippine penal code, which metes out sentences for convictions against anyone who offends sensibilities during a religious ceremony. But he is right. A few words about the realities of life and the need for the Church to take a back seat in such matters is sorely needed in a country where, according to the World Bank, 25 million people out of a total population of 100.8 million live in extreme poverty. The Pope’s itinerary includes an open-air mass on January 18 and a trip to Tacloban, scene of enormous devastation a year ago when Typhoon Haiyan struck. Climate change and loss of bio-diversity was expected to feature in the five-day visit. 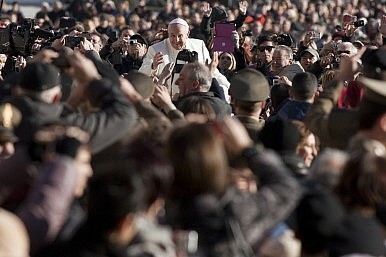 He will have five pope-mobiles on hand. None are bullet proof like those used by his predecessors, which Pope Francis has compared with a sardine can. Crowd expectations for the trip, which also takes in Sri Lanka, are enormous. As a precaution Francis Tolentino, the chairman of the Metropolitan Manila Development Authority, said the country would not be able to provide enough portable toilets and has urged police and Catholics turning out to consider wearing adult diapers. It was a bizarre request but is sadly indicative of a country that occasionally invites sanitary comparisons with India. Why Southeast Asia is featuring prominently in the Catholic Church’s agenda.